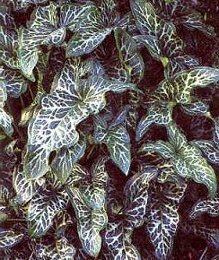 Hardy tuberous plants belonging to the Araceae family with large deeply veined leaves. They are used most often as accent plants for landscaping and containers. They should be planted in a sunny or lightly shaded location in a deep rich soil.